Just like the peninsula corridor, the other end of California's planned high-speed rail network, in the Los Angeles basin, could also benefit from European-style "blended" service where electrified commuter trains and high-speed trains share tracks and stations. Many of the solutions being developed by Caltrain for the peninsula corridor could also prove useful in the LA region, something that is not lost on rail supporters. Paul Dyson, president of the advocacy group RailPac, recently wrote a letter to the relevant authorities expressing support for the idea of electrifying portions of the Metrolink commuter rail network to better integrate with high-speed rail. His proposal is aptly named "Electrolink". Cost. Chair McCallon: "Caltrain's 51-mile electrification modernization project is currently projected to be between $1.45 and $1.5 billion (infrastructure and equipment). Metrolink operates on over 500 miles of track which would make this option very cost-prohibitive." Zing! He does have a strong point, in that Caltrain's electrification project is probably the world's most expensive electrification program, per route-mile. Caltrain can evidently afford pre-construction cost blowouts that Metrolink can't. Schedule. Chair McCallon: "Caltrain's experience shows them to be behind schedule in their 24th year of planning the electrification of their 51 mile segment between San Francisco and San Jose." Double Zing! He is of course referring to old studies of Caltrain electrification dating all the way back to the early 1990s, and pointing out that Caltrain's planning process is just now coming to fruition. In Caltrain's favor, this is largely due to a lack of money and political will, and not to any technical obstacles. Shared Corridors. Chair McCallon: "Caltrain, even with very limited freight service on the San Jose to San Francisco line is struggling with electrification compatibility with freight trains. Metrolink, on the other hand, operates on shared corridors with much more frequent Amtrak passenger and freight trains that carry some double stack cars. The electrification vs. freight issues would only be compounded in these rail corridors. Between Los Angeles and Fullerton our trains also operate on BNSF Railway owned lines." This point is spot on. The freight railroads are adamantly opposed to electrifying any tracks where they operate, even if they are not the owners of such track. The last time that Caltrain tried to kick off a CPUC rule-making process to cover 25 kV electrification, in 2007 under CPUC docket P0706028, the process was promptly shut down by the freight railroads. The CHSRA's effort to clear HSR electrification ran into similar opposition, and survives only because it explicitly sidesteps the issue of electrification over tracks used by freight trains. While the contracting process for Caltrain electrification is well underway, on the regulatory front, we have... crickets. Electrification versus freight is going to be a messy fight, one in which Caltrain appears to have no friends, least of all Metrolink. Chair McCallon's lack of vision should be taken with a grain of salt: Metrolink is a struggling organization with sagging ridership, dodgy finances and a governance structure that makes Caltrain look like a well-run corporation. Nevertheless, the underlying issue of compatibility with high-speed rail is at least as important down south as it is here on the peninsula. Let us hope that Caltrain's blended system will blaze a good path for Electrolink to follow. The debate over level-boarding is one that needs to happen now, before trains are purchased. Wherever it leads, this debate must be rooted in facts. All European off-the-shelf bilevel EMUs are designed for boarding from low platforms, and Caltrain needs something off-the-shelf. While these points may have been true in the 1990s, there are examples today that directly contradict them. That doesn't seem to be stopping staff and consultants from advancing the same old arguments in recent discussions, perhaps in an attempt to stave off hard choices about level boarding. 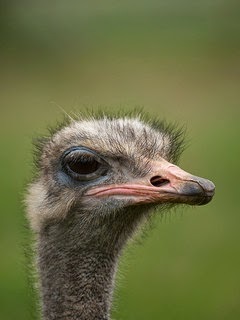 Meanwhile, in Europe, the EMU they claim can't be procured already exists! These images show Stadler's EMU for the Moscow Airport Express, built for level boarding at 51 inches above rail. It will enter service in the coming months and proves without any doubt that such a design is viable. 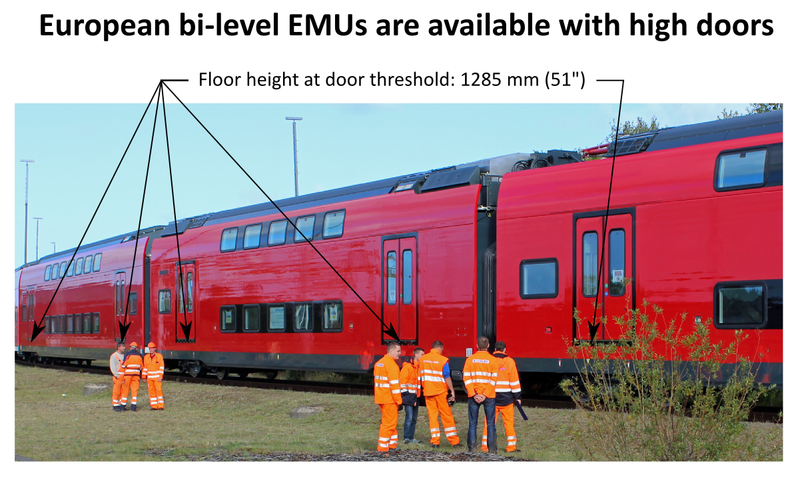 You can take a look at the data sheet or check out the latest photos of this off-the-shelf European bi-level EMU train design. So by all means, let's have this level boarding debate and consider Plan A, Plan B, or any other plan, but please, when briefing decision-makers who understandably don't know any better, let's keep it free of lies and disinformation. UPDATE 05 November 2014: HSR lawyers hang Caltrain out to dry by amending the scope of the rulemaking process explicitly to apply only to "25 kV electrification systems constructed in the State of California serving a high-speed rail passenger system capable of operating at speeds of 150 mph or higher, located in dedicated rights-of-way with no public highway-rail at-grade crossings and in which freight operations do not occur." Could Caltrain possibly not have seen this coming? ORIGINAL POST, 25 May 2014: Feathers are really starting to fly in the Public Utilities Commission proceeding to establish a regulatory framework for 25 kV railroad electrification in California, under CPUC docket number R1303009. Electric utilities and freight railroads are putting up a big fight against the California High-Speed Rail Authority that threatens to leave Caltrain hanging out to dry. With the impending electrification of the peninsula corridor clearly in mind, the freight railroads asserted in January comments that "it remains unclear if the proposed rules will be sufficient for high-speed train operation in shared rights-of-way” and that “[i]f the CHSRA does not amend its petition to clearly state the intended scope of the rulemaking, the Commission should order further workshops to ensure that the proposed rules are carefully vetted out for application in shared rights-of-way." Freight railroads are concerned about a number of compatibility issues, including electromagnetic interference with their signaling systems and vertical clearance for their freight cars. Electrification could impair vertical clearances especially under bridges. The purpose of these rules is to establish uniform safety requirements governing the design, construction, operation and maintenance of 25 kV ac (alternating current) Railroad Electrification Overhead Contact Systems (OCS) constructed in the State of California in right-of-ways dedicated solely to passenger use with no public highway-rail grade crossings and in which freight operations do not occur. [The freight railroads] know that the proposed General Order is not ambiguous and that it will not apply to track where freight operations occur. Their continuing refusal to be satisfied on this point reveals a desire to delay and obstruct this proceeding. The peninsula corridor, of course, meets none of these criteria. It is not dedicated solely to passenger use. It has numerous highway-rail grade crossings. Freight operations occur daily. The freight railroads are understandably worried about this issue of scope, given that the legislature has allocated more than a half-billion dollars of HSR funding to electrifying the peninsula corridor; Caltrain plans to complete the electrification project in just five years. Where does that leave Caltrain? That leaves Caltrain with few options. It has been suggested that the rulemaking process would be less contentious if a smaller "short-line" freight operator were to buy the trackage rights UPRR enjoys on the peninsula corridor. Presumably, such a short-line operator would be less adversarial in the negotiation of a mutually agreeable regulatory framework and technical solution for electrification. This scenario unfortunately fails to take into consideration the precedent-setting nature of placing 25 kV electrification over any track where freight operations occur, regardless of ownership. The big freight railroads, UPRR and BNSF, will be no less interested in such a proceeding at the CPUC than if their own tracks were being electrified. Section 8.3.c of the trackage rights agreement with UPRR specifically allows for the wholesale abandonment of freight service on the peninsula, should Caltrain "demonstrate a reasonably certain need to commence construction on all or substantially all of the length of the Joint Facilities of a transportation system that is a significant change in the method of delivery of Commuter Service which would be incompatible with Freight Service." While 25 kV electrification over freight trains doesn't seem to be such a big deal on the East Coast or the rest of the world, the freight railroads' arguments in the latest CPUC proceedings could be construed as a belief that 25 kV electrification is fundamentally incompatible with freight operations in California. Do we really want to go there? Caltrain will bring a knife to a gunfight if they don't get their act together soon. Plan B: four doors per car. What if the recent talk of platform compatibility was just a bunch of lip service, and the high-speed rail authority remained uncompromising on their requirement for platforms and train floors at a 51" (1295 mm) height above the rails? Then we need to be prepared for Caltrain Level Boarding Plan B. By definition, Plan B will never be as good as Plan A. Plan A is a workable compromise solution that would enable a gradual transition to a fully compatible blended system where Caltrain and HSR can share the same station platform tracks with 100% level boarding. Plan B is to join HSR in their choice of 51" platforms, however misguided it may be. The transition to 51" platforms, from today's 8" platform height, seems at first a much more complicated problem. But is it really? What if you did this to Caltrain's new EMUs? 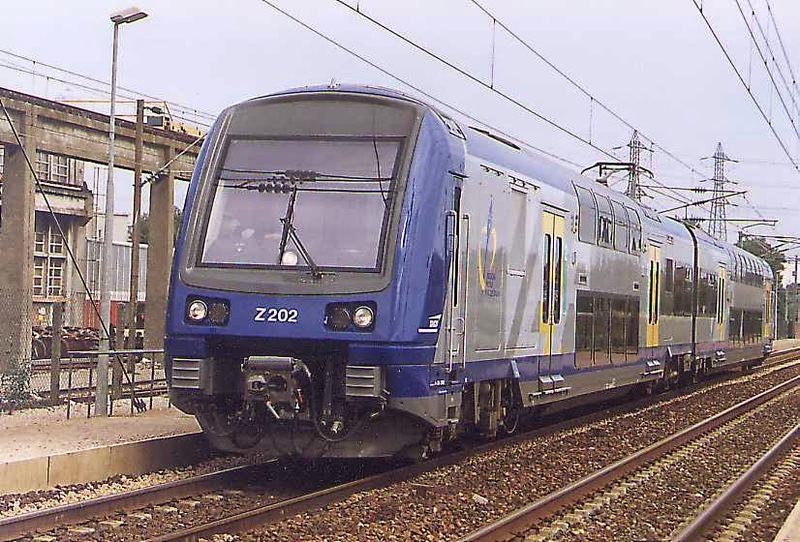 The train depicted here has two sets of doors, one pair for 51" platforms located on the mid level at the ends of each car, and another pair (quite similar to the Bombardier cars, with two steps up from an 8" platform) on the lower level. This is only a minor tweak to Caltrain's plan, taking advantage of the vehicles to facilitate a gradual transition from today's 8" platforms to level boarding at 51". During the transition to level boarding, only one set of doors opens at each stop, depending on the platform height at that stop. Extra doors take away seating space. Additional vestibule areas will consume the space for at least 16 seats per car, or about 12% of train's overall seating capacity. However, Caltrain already needs better standing areas to handle peak loads, and these vestibules could be a good way to comfortably accommodate standees. The loss of seating could also be compensated by going five-abreast in extra-wide trains. Extra doors will cause breakdowns. While the overall reliability of a train certainly depends on how many doors it has, the failure rate of any given door is better measured in mean cycles between failures, rather than mean time between failures. There is not a single additional door cycle since only one pair of doors opens at any given stop, so breakdowns and maintenance expenses will certainly not double. Wheelchairs need the ability to change levels. During the transition, when some platforms are at 8" and others at 51", wheelchairs may need to board and alight at two different heights. A large ADA-compliant bathroom may also need to be placed in the roomy lower level. This implies a requirement for a wheelchair lift inside at least one vehicle in the train. It would be a packaging challenge, but is certainly not unprecedented. Bicyclists need to navigate interior steps. The large contiguous areas required for efficient bicycle storage (sorting bicycles by destination as is currently the practice) would most likely be located on the lower level. When boarding and alighting at a 51" platform, bicyclists would need to negotiate 3 steps inside the train, possibly while it is moving. This is certainly a challenge, but must be considered in the context of today's situation, where bicyclists have to maneuver inside a moving train to access a 40-bike storage area through a single 3-foot narrow entrance after climbing up four steep steps and turning the corner around a pole--sometimes in the middle of a Giants game crowd. Providing stair gutters in the bicycle car steps (which, by the way, would be longitudinal steps that could be built far less steep than those transverse gallery car steps) could make interior navigation far easier than it is today. Extra doors will make the trains more expensive. There is no question that this extra complication will lead to extra expense, but the key question is how much? The extra pair of doors will be responsible for perhaps an extra 5% capital cost. On a half-billion-dollar fleet purchase, this amounts to $25 million, an amount that sounds enormous to anyone with a mortgage. But $25 million is a pittance in the context of the thousands of millions (billions!) required to build separate station infrastructure for Caltrain and HSR. The extra cost is a rounding error, and a good case can be made for HSR picking up the compatibility tab. Trains are difficult to build with that many doors. Structurally speaking, each door opening compromises the strength of the car body structure, reducing its ability to withstand the enormous loads during a train wreck. The crashworthiness of rail cars is highly regulated by the FRA, and achieving compliance for a four-door car could be quite an engineering challenge. This is a question best left for car builders to answer. So yes, admittedly, Plan B is sub-optimal for a number of reasons as described above. It is quite controversial even among Caltrain advocates, many of whom harbor a visceral dislike of 51" platforms. This dislike goes so far as to lead them to a very strange advocacy position: that Caltrain and HSR should have separate platforms! As we have often discussed, separate platforms are an operational disaster waiting to happen at San Francisco Transbay, since every inbound Caltrain movement will conflict with every outbound HSR movement. This constraint will limit the capacity and future growth of the blended system. And it's not just a Transbay issue: separate HSR stations at Millbrae, the mid-peninsula, and San Jose will require billions of additional infrastructure spending that would not otherwise be necessary. Is that a better outcome than Plan B? Supposing Plan A fails and HSR insists on 51" platforms, then Plan B is the best of the rest. It is a simple plan, and a reasonable solution for not precluding common platforms in the future. Anyone who takes issue with it owes a detailed description of their own specific plan to make Caltrain and HSR more compatible. Send every single Caltrain into Transbay. Leave no train stranded at 4th and King. Caltrain has always had a lot of potential. With such juicy ridership demand as this corridor enjoys, it will be hard to call Caltrain's "modernization" a failure, but so far it doesn't promise anything more than this baseline of mediocrity. To be sure, electrification is a huge step forward compared to most other commuter rail systems in the U.S. But that's the wrong frame of reference. This is San Francisco, this is Silicon Valley, where we never stop short of making things better, where "good enough" is quickly left behind, where innovation is prized, and where ambition fuels a relentless drive to change people's lives for the better. There is no other place like it in America. Will Caltrain's new General Manager have the vision it will take? step is 10", the second 7"
With a 25” floor threshold, the new fleet will still be compatible with the existing fleet and platforms and could transition to level boarding over time. "Existing fleet" in this context means the Bombardier bi-level cars, known to the layperson as the red Baby Bullet cars. Caltrain plans to keep these cars for a few years after the new EMUs arrive. The Bombardiers already have a floor height of 25" above the rail, although existing 8" platforms currently require two steps up, as seen in the photo at right. The statement above sounds like a genuine interest in compatibility, and at first reading seem to make sense. But let's analyze Caltrain's ideas about compatibility more closely. Suppose for a moment that we planned to "transition to level boarding over time" at 25 inches, because we think it's smart to match the floor level of the Bombardier cars so that we can keep using them after the conversion to level boarding. Is that even a feasible scenario? The "before" and "after" cases are straightforward. Before transition is just the way things are today. After transition is complete, the entry steps are easily modified to match the interior floor height, achieving gap-free level boarding just like this photo of Utah FrontRunner Bombardier cars docked at 25-inch platforms. Bombardier cars cannot serve an evolving mix of 8" and 25" platforms during a transition to level boarding over time. Once the transition to level boarding is complete, maybe in the mid-2030s, the Bombardier cars will be at the end of their useful life. Given the limited remaining lifetime of the Bombardier cars, their inflexibility during transition, and their dwindling residual value, there is little value in matching the new level boarding platform height to the Bombardier cars. There may even be negative value in doing so. mini-high is at 22 inches ATOR. This is primarily an issue of wheelchair boarding. 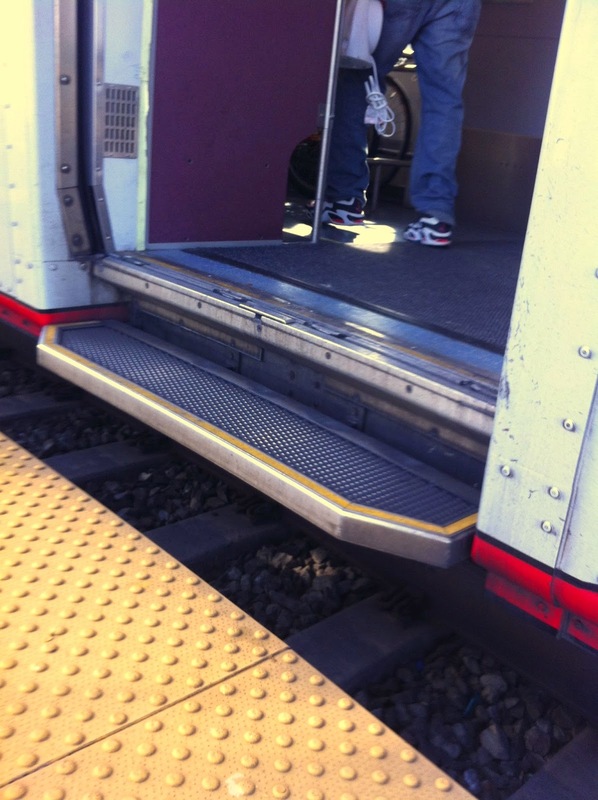 Matching the new EMUs to the 25-inch floor height of Bombardier cars allows Caltrain to procure EMUs without vehicle-borne wheelchair lifts, which are expensive to purchase and maintain. Instead, the EMUs would re-use the existing mini-high platforms to perform wheelchair boarding, using a bridge plate to span the large gap between the mini-high platform and the train. (Recall this ~3-foot gap is present in the first place because of a California PUC regulation on side clearances for freight trains). Suppose for a moment that we planned to buy EMUs that have to make use of the existing mini-high platforms, which are built 22 inches above the rail and set back 8 feet from the track center line. What we have is a geometry problem: the ADA slope regulations constrain the vehicle floor height that is reachable from the existing mini-high platforms. The maximum reachable height is about 27 inches, which (after accounting for a bit of margin) may explain Caltrain's fixation on 25 inches. But then consider also: each mini-high platform is worth (generously) about $150k to replace. On a system with 27 stations, 54 mini-high platforms will cost about $8 million to replace. While that sounds like a lot of money ("Eight Million Dollars!") this sum is a pittance on the scale of the investments being contemplated. Eight million dollars is two percent of the cost of the new EMU fleet, and less than a percent of the cost of the electrification project. Put simply, the mini-high platforms have insignificant value and are a trifle to replace. Designing Caltrain's future around them is certainly penny wise, but quite possibly pound foolish. While Caltrain is no doubt very attached to its growing collection of mini-high platforms and its expanding Bombardier fleet, neither of these items should drive the design of the future platform interface for level boarding. 25 inches is a fine platform height, but selecting it on the basis of these two perceived "constraints" could prove very unwise in the long run. Caltrain appears to have an uncomfortable relationship with the level boarding issue: it's a distraction from their current big project to electrify the railroad, it's logistically far more challenging to plan for than just stringing up some wire, it involves fighting clearance regulations that are dear to the freight railroads, it isn't funded, and they'd rather not think about it right now because the issue gives them a headache. But what sort of modernization is this if level boarding becomes a careless afterthought? The California High-Speed Rail Authority recently abandoned its plan to procure trains by piggybacking on an Amtrak order of new trains for the Northeast Corridor. This news isn't all that surprising: the two have such different requirements that it never made sense for California to hitch its cart to the wrong end of Amtrak's horse. The effect is to free California from the prescribed platform interface in use on the Northeast Corridor, where the platform edges are located 48 inches above the top of the rail and offset laterally by 67 inches from the center line of the track. An earlier recommendation that Caltrain should use high platforms to ensure compatibility with high-speed rail, especially in highly constrained stations like San Francisco Transbay, still stands. The specific dimensions of the platform interface, however, can be optimized for California at a height less than 48 inches and offset greater than 67 inches. These conditions have direct implications for the upcoming procurement of Caltrain EMU trains. 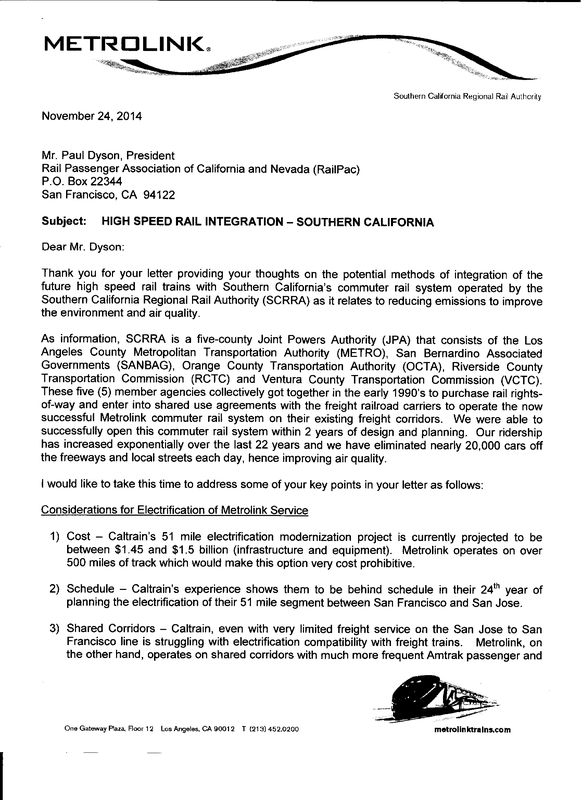 Caltrain recently sent out a Request For Information to train manufacturers. This RFI discusses the platform interface issue but considers only a high option (~50") and a low option (~25"). Are those really the only options? 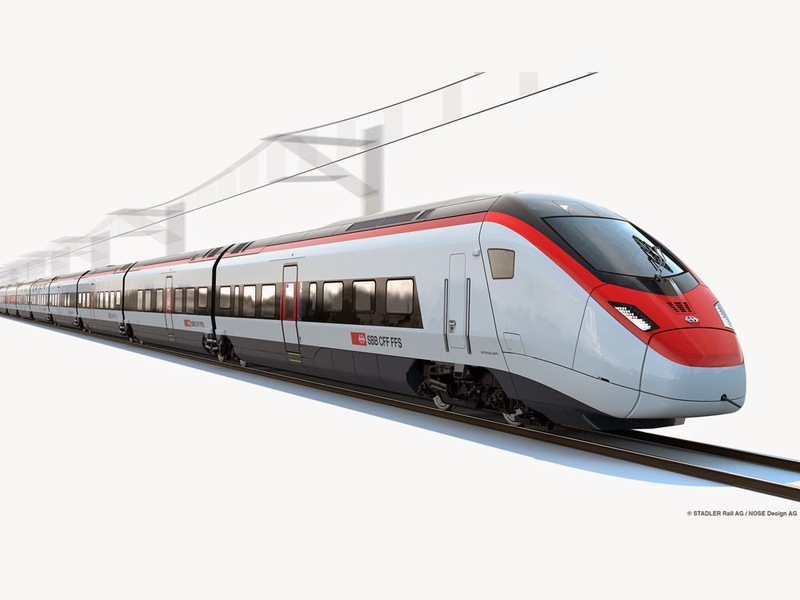 Europe, where "blended" high-speed rail is the rule rather than the exception, is gradually standardizing around two platform heights: 550 mm (21.7") and 760 mm (29.9"). Accessibility laws are becoming more stringent, forcing train floor heights to match the platforms for seamless level boarding. 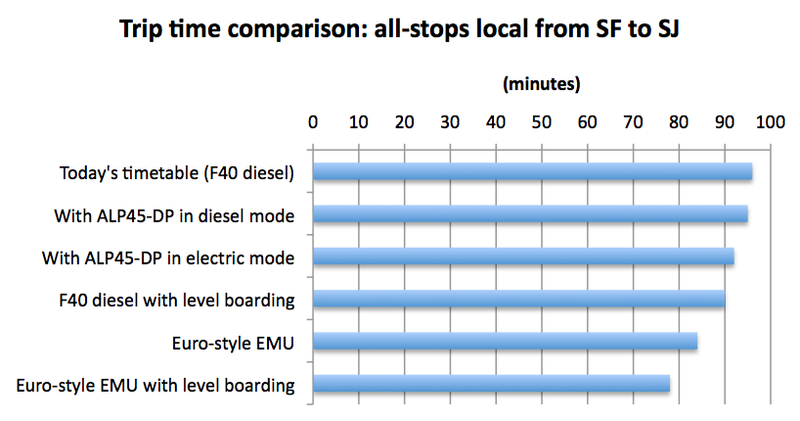 The traditional single-deck high-speed train designs now operating in Europe, including recent models designed in the last decade such as the AGV and Velaro-D, still don't allow level boarding. Two or three steps are necessary depending on platform height, to the increasing dismay of advocacy groups for persons with reduced mobility. The next generation of single-deck high-speed trains, of the sort that California might order later this decade, are designed for level boarding with entry floor heights of 760 mm; for example, the Talgo Avril and the Stadler EC 250 (shown at right). Accessibility requirements will eventually leave the big three manufacturers (Alstom, Bombardier and Siemens) with no choice but to follow suit and offer high-speed trains capable of level boarding, most likely at 760 mm. 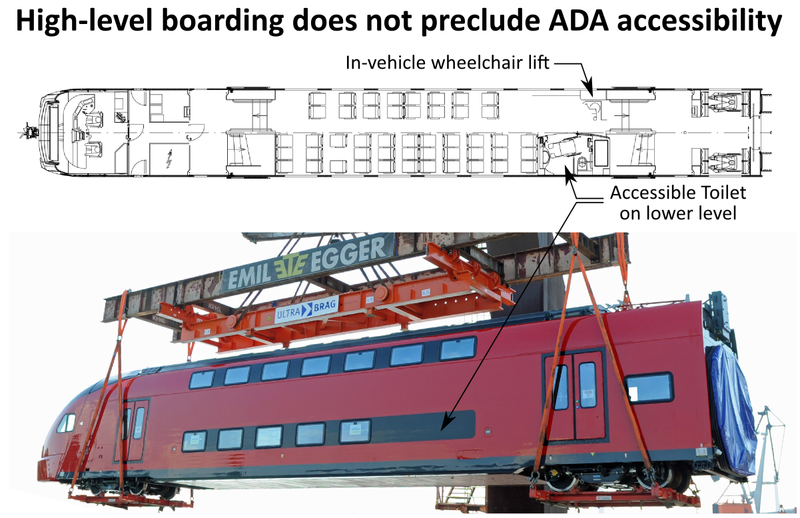 it is high enough that a single-deck high-speed train can be designed with a continuously accessible floor with no interior steps throughout the entire length of the train, per ADA requirements. Floor heights lower than 760 mm quickly become impractical for providing accessibility throughout all cars of a single-deck high-speed train, as required by Federal Railroad Administration regulations that implement the ADA (specifically 49 CFR 38.175). The train's floor must rise over wheels and traction gear that can be significantly taller than 760 mm, so lower floors lead to impractically long interior ramps or lifts to enable wheelchairs to move about between train cars. Floor heights higher than 760 mm are not practical for boarding and alighting from the lower level of a bi-level EMU, and push the entry doors out over the wheels at the ends of train cars, resulting in unevenly-spaced doors that may impede passenger flows on station platforms and increase station dwell times. The transition to level boarding, regardless of the selected platform height, will not take place overnight. For logistical and financial reasons, there will be a period of several years during which commuter trains will serve a mish-mash of old and new platforms at differing heights. To allow uninterrupted service through this transition, the trains will require built-in movable steps to serve both heights. This isn't a new problem. Numerous trains worldwide have been designed to address it, as seen in the image and videos below. This is however a deceptively difficult engineering problem, because the step mechanism and controls must be incredibly reliable to prevent trains from breaking down and disrupting service. Consider that a single train opens a dozen doors at every stop; if 100 trains a day make an average of 16 stops each, there will be about 20,000 door cycles per day. If each door cycle has a failure probability of just 1 in 100,000, we are still left with an 18% chance that one or more doors will fail and disrupt service on any given day. That's why even a 1 in 100,000 failure probability is not acceptable for a door mechanism, as a number of operators have found out the hard way. The lesson is clear: these mechanisms must be designed with the utmost simplicity and reliability. 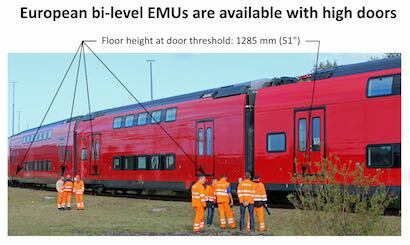 For Caltrain's new EMU fleet, that could be nothing fancier than a single step deploying from each door, as shown in the cross-section diagrams below. Train floors are drawn in dark red. The EMU steps, shown in the third diagram from the top, are a bit taller than one would like with an 11-inch rise. That's 1 inch taller than today's first step, but probably acceptable for a temporary transition period until all platforms are raised and the step mechanisms can be permanently retired. Note also that as drawn here, the extra width of the new cars would place the new platform edge 70 inches from the track center line, a full six inches outside of the nominal Plate F loading gauge. This dimension might ease any concerns from Union Pacific that high platforms would interfere with freight service, or from the government about STRACNET clearances. Nevertheless, this compromise, or one very similar to it, provides the only viable path toward a high-speed rail system that is seamlessly interoperable with Caltrain and Metrolink in Southern California. The guiding principle of "any train, any track, any platform" will pay off with billions in infrastructure savings state-wide, more efficient utilization of station platforms, and valuable minutes saved on every connecting trip. Thinking about this transition ahead of time, and designing the EMU fleet around the new platform interface, has essentially zero up-front cost. In the long run, doing it right the first time saves money because we won't have to do it over in order to achieve the numerous benefits of level boarding. Caltrain may not fully realize this, but their decision about the platform interface for their upcoming EMU procurement could set a generational precedent for the entire California rail system. Will they give it the consideration it deserves? One of the arguments against level boarding is that it would involve a massive reconstruction of just about every single station platform along the entire peninsula rail corridor without interrupting rail service. On the face of it, that sounds like a very expensive logistical challenge, simply too hard to take on with all the other modernization efforts currently underway. Would you believe that Caltrain has already done it? Over the last 15 years, no fewer than 37 station platforms have been built from the ground up. 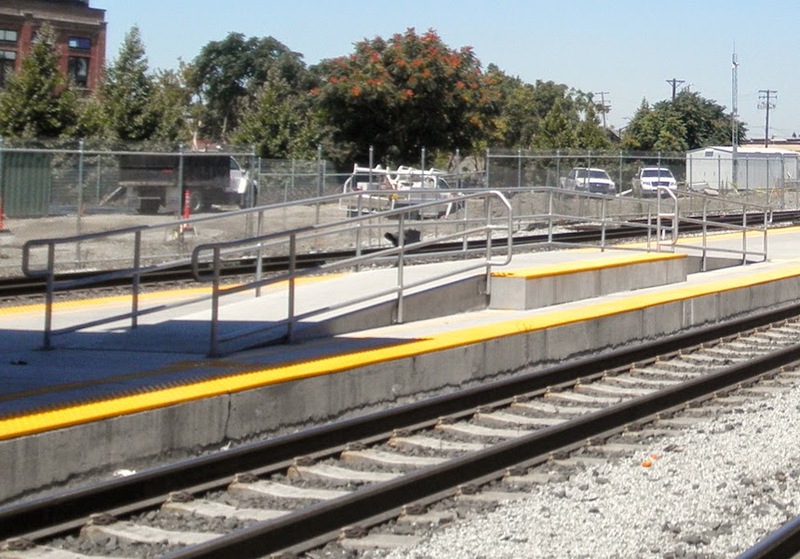 Following Caltrain's forward-thinking strategic plan, these new platforms were all built for future compatibility with level boarding rolling stock, after a hard-fought waiver of CPUC General Order 26D. This regulation had previously limited platform heights to 8 inches, causing lengthy station dwells and slowing Caltrain trip times, which thankfully have improved by several minutes over the last decade. Um, never mind, scratch that entire last paragraph! All of these new platforms will have to be re-built all over again to achieve level boarding. 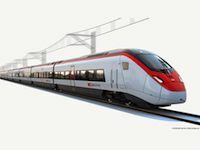 Caltrain has demonstrated that they know how to build a large number of new platforms over a time span of a decade or so, which is why it's particularly important that the new EMU rolling stock (which will last three decades) be pre-configured for a future level boarding platform interface. It would truly be a shame if an effective level boarding solution--fully compatible with high-speed rail--were to be precluded through bad procurement choices made today in 2014. 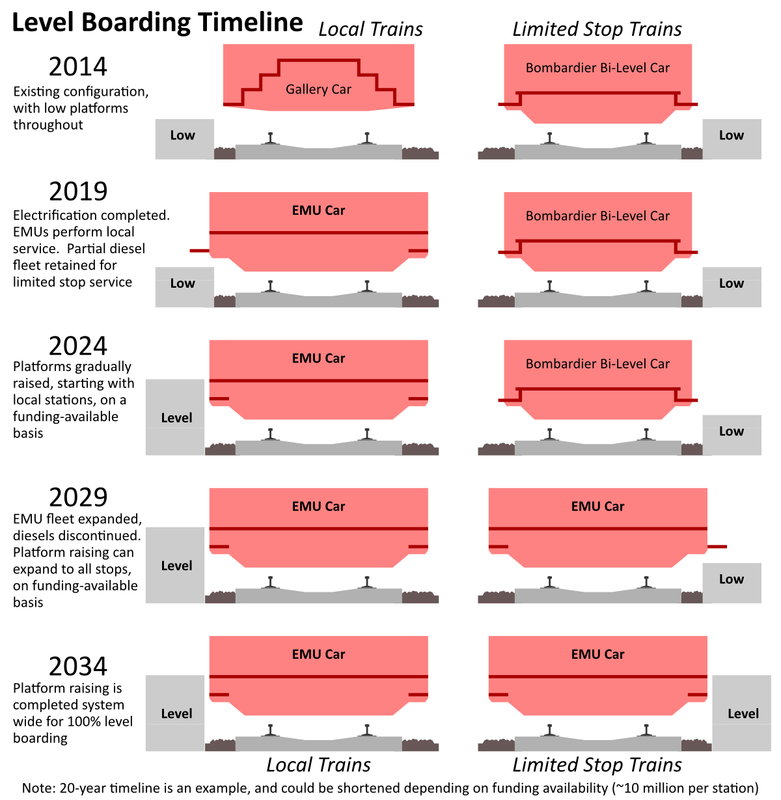 Here's hoping that Caltrain's 2014 strategic plan will reflect a new vision for level boarding and a new understanding of its advantages for reducing trip times, improving service punctuality, increasing train average speeds, and increasing the overall throughput capacity of the peninsula rail corridor. Over the years since, this Photoshop job has found its way into all sorts of places, from newsletters to websites to business plans and countless documents across many agencies and groups involved in modernizing the peninsula corridor. I even spotted a framed copy at the Station Café in San Carlos, among hundreds of railroad photos from all over the world. I'm glad it took off like this, and I wish to give Benoît belated credit for the original photo. This is the huge double-deck, extra-wide, high-platform EMU for Moscow's airport train. 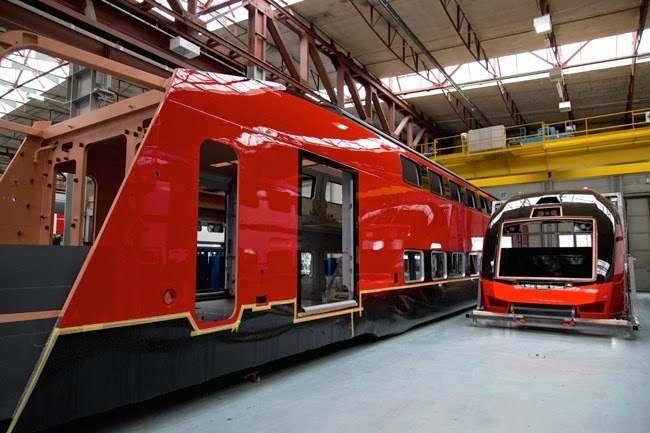 In a 25 kV version with an extra (temporary) pair of doors on the lower deck, these would make an ideal tool for gradually transforming Caltrain from a 20th century diesel commuter train into a fast, high-capacity level-boarding system fully compatible with high-speed rail. Maybe if those trade sanctions kick in, they won't have anywhere to go? Blended System issues. Access to San Francisco’s Transbay Terminal has posed a challenge to the program from the beginning. The ideal engineering outcome – a new, four track system separating HSR from Caltrain and freight service – was problematic because of its high cost and environmental impact. An alternative approach was adopted that blends the services of Caltrain and HSR on the same two track system, mostly within the existing right-of-way but with specific additions of passing tracks where needed and with the possibility of incremental increases in capacity when justified by demand. When combined with electrification of the Caltrain lines, paid half-and-half by Caltrain and HSRA, this approach should work to serve the needs of both systems at least through the first decades of the Phase I Blended system. In a number of our previous letters, the Group has supported the blended system approach; our comments below are aimed at improving its implementation. Currently, Caltrain uses a platform height of 8” above rail. 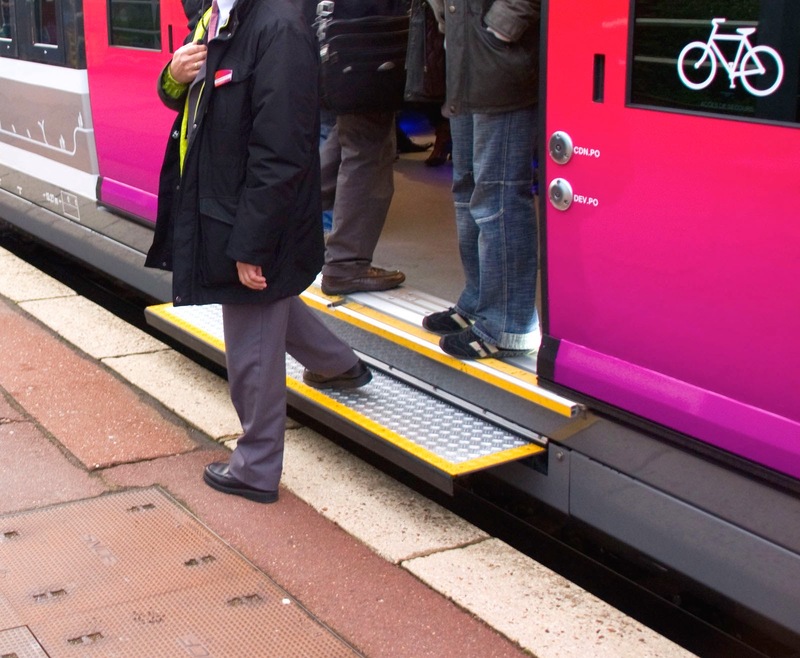 This means that boarding/de-boarding requires stepping up/down from the floor of the train (25” above rail), which can impose delays and risks of tripping and falling, especially when the needs of disabled passengers must be accommodated. The result is longer and less reliable schedules. The low platform height is dictated by the regulations of the California Public Utilities Commission (PUC) that require platforms to be no higher than 8” on tracks that may also carry freight trains. 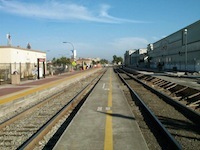 Unless a waiver from this regulation is granted, or expensive track work is installed, Caltrain will be limited to low platforms. At its current frequency of services, the lack of level boarding is manageable (if undesirable), but it will become much less tenable when Caltrain frequencies are increased and HSR trains are added. Under current plans, the floor of HSR trains will be about 50” above the rails, which is typical practice for most of the world’s HSR systems and consistent with Amtrak’s plans in the Northeast Corridor. Caltrain is experiencing rapid demand growth, a process that will accelerate when service to the Transbay Terminal is inaugurated. 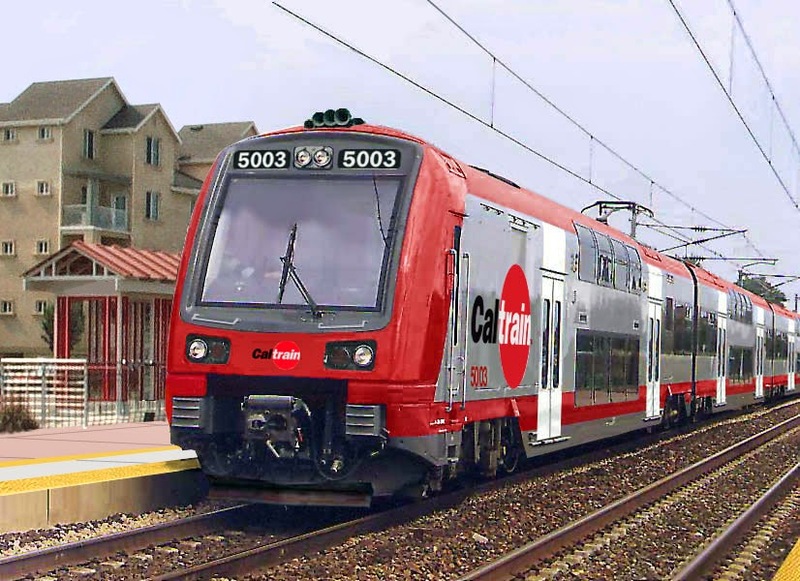 Caltrain’s plans call for acquiring new bi-level, electric multiple-unit rolling stock. Since the existing Caltrain coaches have a 25” floor level, consistency would suggest a 25” floor level for the new equipment. This would mean that platforms for the two systems would be at different levels, making transfers within station more difficult to arrange. This might be manageable at many common stations where Caltrain and HSR could have separate platforms, but the platform disparity would be more serious at the Transbay Terminal because the number of platforms is limited. As a result, routing of traffic into and out of the station will be more complex, and dispatchers will not have the flexibility to send either system to all platforms when delays or operating problems would otherwise dictate. One approach, turning a number of Caltrain services at 4th and King and limiting the number of Caltrain services to the Transbay Terminal, has been suggested, but would pose restrictions for Caltrain’s access to the Transbay Terminal. The basic standards of the PUC for electric catenary wire call for a clearance of 22 feet 6 inches above the rail. One the one hand, both Caltrain and HSR may want a lower catenary height in order to reduce construction cost for which the PUC will have to grant permission: on the other hand, the Union Pacific and port interests may want to protect the hypothetical possibility of future freight cars requiring even more clearance. HSR’s current electrification designs are appropriate for HSR-only operations and may not be acceptable for use in the Caltrain area. There are a number of specific locations where Caltrains’s clearance is already below 22 feet 6 inches, but there is no generally agreed height limitation. Positive Train Control (PTC) is a requirement of Federal law. Facing this mandate, Caltrain developed its own system – CBOSS – that is now being implemented. CBOSS may not be appropriate for use by HSR trains. If so, HSR trains may have to deal with two signal systems. In addition, the Union Pacific Railroad will have to operate in the same territory so will have to have conforming signal systems in its locomotives. None of these problems is impossible to resolve, albeit at added investment and operating cost by one or more of the parties. There is nothing unique about having multiple freight and passenger operators on a single line and there is experience in the U.S. and Europe with resolving the normal issues. All parties in the blended area are aware of the issues and there has been full cooperation among them. We are concerned, however, that near-term decisions could be made by the parties acting separately that would ultimately compromise the performance of the system. For example, a decision by Caltrain not to plan for at least 25” platforms, which would provide an essential approach to level boarding, would lead to increased delays and uncertainty that could become unmanageable when Caltrain frequencies increase to meet the rapidly growing demand, especially that caused by the opening of the Transbay Terminal. This problem would get worse when four HSR trains per hour are added to the blended system in 2026. Caltrain will definitely need an expanded fleet, and bi-level cars are an efficient way to meet the need. That said, a decision to buy 25” floor level, bi-level coaches would mean that Caltrain and HSR would be committed to operating on incompatible platforms, which would add rigidity to a system that will be challenged for capacity. This problem could be alleviated if Caltrain ordered coaches that can serve both platform levels or if it adopted a uniform 50” platform, but either solution would clearly add investment costs above those planned. In all cases, the design of the electrification for Caltrain will need PUC approval and will need to consider the interests of all of the operators on the line. This is a complex issue involving technology, investment, system performance and sequencing including the interests of a number of parties. Clearly there is no perfect answer and it is actually a problem resulting from success in attracting more passengers. 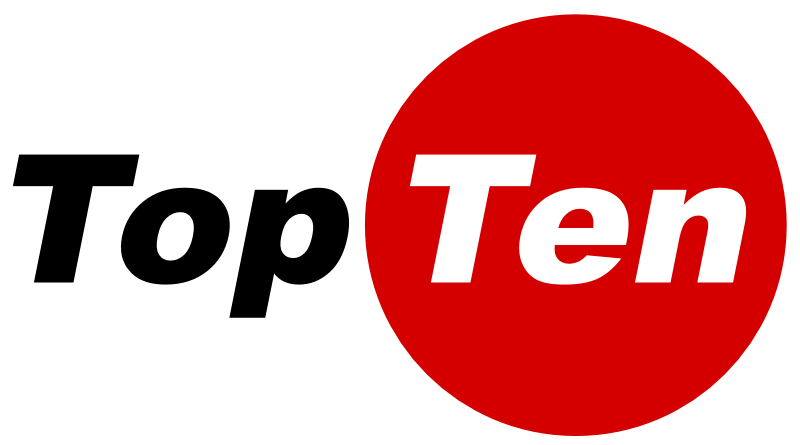 We recommend that the Legislature request periodic joint reports from Caltrain, HSR and the Union Pacific Railroad that will use the tools available, including line capacity simulators, to assess the impact of alternative approaches to coach floor and platform height on capital and operating cost, capacity and reliability of both systems. This would include the impact on Caltrain if it has to construct 25” or 50” platforms. This study should also include the investment and operating cost impact of the alternative approaches to catenary height and platform clearance and should outline the decisions that the PUC will be asked to make. Blended operations also pose the issue of accidents at grade crossings. Even at its existing speeds and frequencies, Caltrain experiences about 20 grade crossing and intruder deaths per year and generates delays on the local streets as autos and trucks wait for passing trains. This will get worse as train frequency and road traffic both increase over time. It would be difficult to overstate the risks of more frequent, faster and quieter Caltrain service combined with 110 mph HSR trains interacting with growing road traffic in the middle of California’s increasingly busy cities. We recommend that the Legislature ask Caltrain, HSR and the communities involved to develop a joint report assessing the likely future risks of increasing train traffic and speeds on the grade crossings in the areas impacted and identifying possible approaches to resolving the issue over time. The Peer Review Group's comments are a wake-up call to start breaking out of the silo mentality that is prevalent in our transportation agencies, where "staying the course" is too often the overriding consideration. The blend can only succeed if all stakeholders adjust their plans and projects to achieve better coordination and system-level integration. The Peer Review Group understands that we are at a juncture where this opportunity must not be squandered. The radial clearances shown below are recommended minimum clearances that should be established, at time of trimming, between the vegetation and the energized conductors and associated live parts where practicable. Reasonable vegetation management practices may make it advantageous for the purposes of public safety or service reliability to obtain greater clearances than those listed below to ensure compliance until the next scheduled maintenance. Each utility may determine and apply additional appropriate clearances beyond clearances listed below, which take into consideration various factors, including: line operating voltage, length of span, line sag, planned maintenance cycles, location of vegetation within the span, species type, experience with particular species, vegetation growth rate and characteristics, vegetation management standards and best practices, local climate, elevation, fire risk, and vegetation trimming requirements that are applicable to State Responsibility Area lands pursuant to Public Resource Code Sections 4102 and 4293. The CPUC rule establishes minimum clearance of 4 feet at the time of trimming, and gives Caltrain discretion to increase the clearance as needed. Caltrain has added another 3 feet of allowance for wind sway, and another 3 feet on top of that for vegetation growth between trimmings. 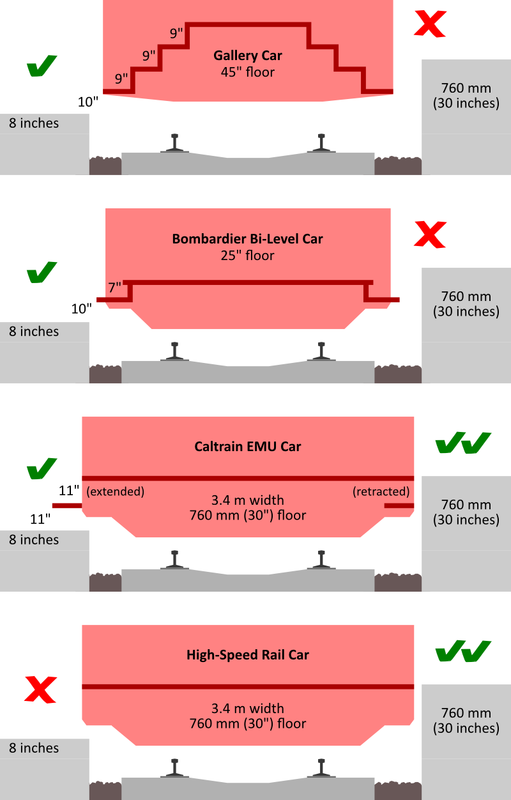 This brings the overall clearance carried in Caltrain's DEIR to 10 feet, as shown in the diagram at right. This 10-foot clearance drives the number of trees impacted by the project: 2,200 are due for removal and another 3,600 for pruning according to the DEIR. This configuration tends to have the worst impact on vegetation, mostly because the 50 kV feeder wires attached to the tops of the poles are near vegetation all along the right-of-way, even in the long open spaces between poles (right-hand diagram). This is the main reason why 2,200 trees face the chain saw. While this configuration spreads the tracks apart by four feet, the resulting impact to vegetation is less, especially between pole locations, because the feeders are kept away from vegetation. The down side is that tracks need to be moved apart; this is not very difficult except where cross-overs are located. The portal configuration has the least impact on vegetation between poles (right-hand diagram) but isn't particularly beautiful (left-hand diagram). Most of the 2,200 trees threatened by electrification probably aren't worth saving. They are typically not "heritage" trees, and consist mostly of unremarkable species that have grown haphazardly into the right-of-way. 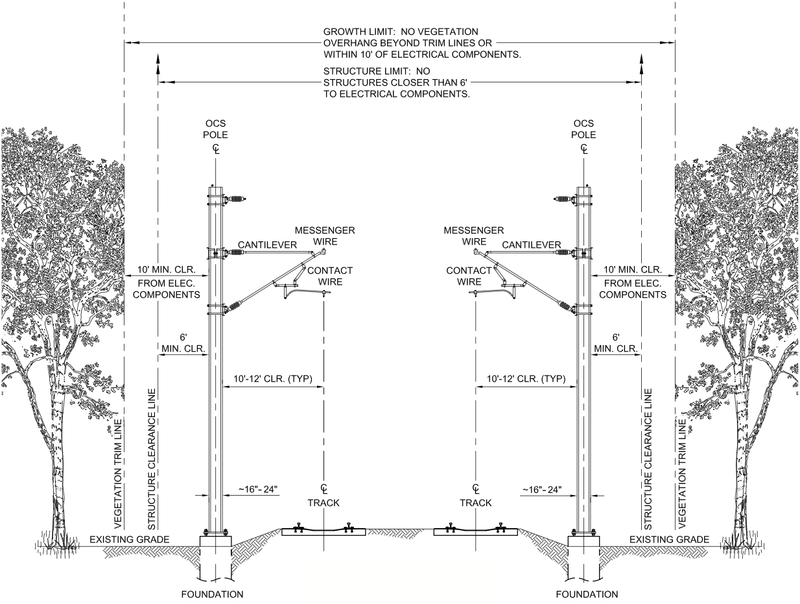 But there are surely certain trees worth saving, and for those, the support arrangement of the overhead contact system can be engineered to keep high-voltage feeders away from vegetation, over the tracks. Release of the revised DEIR, a major step to clear the electrification project under CEQA. Compared to the last edition of this document from 2009 (itself warmed over from 2004 and used to garner FTA approval of the project under NEPA), this update is a much stronger and more thorough document that clearly reflects the higher degree of public awareness of the project. The JPB plans to certify the final EIR this fall. At the next board meeting, award of a six-year $4.3 million contract to the new Director of Project Delivery, Dave Couch. This is a name we'll see much more of in coming years, as Mr. Couch will take charge of orchestrating the day-to-day management of the army of consultants, staff and contractors that will expend $1.5 billion to deliver the modernization project. It appears that he will report to Marian Lee (CalMod executive officer). 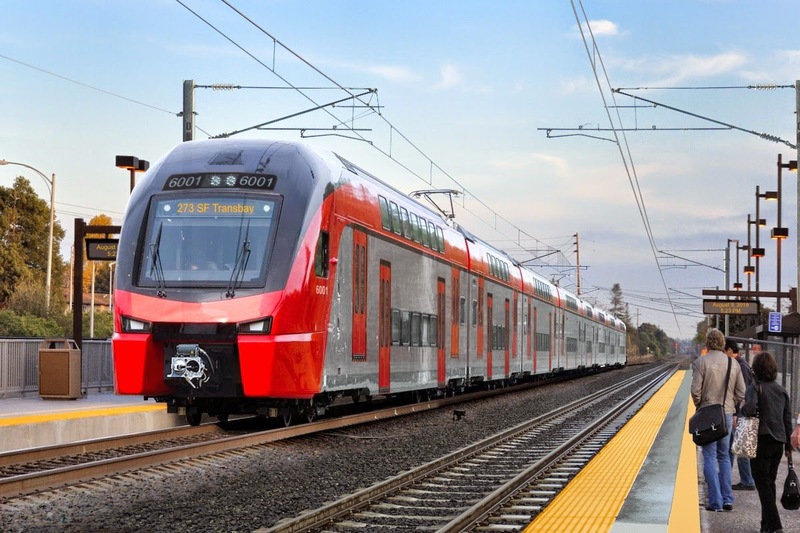 Also at the next board meeting, award of a six-year, $24.2 million contract to LTK Engineering Services to carry out the procurement and supervise the design, manufacture, delivery, testing, and entry into service of Caltrain's new fleet of Electric Multiple Unit (EMU) trains. 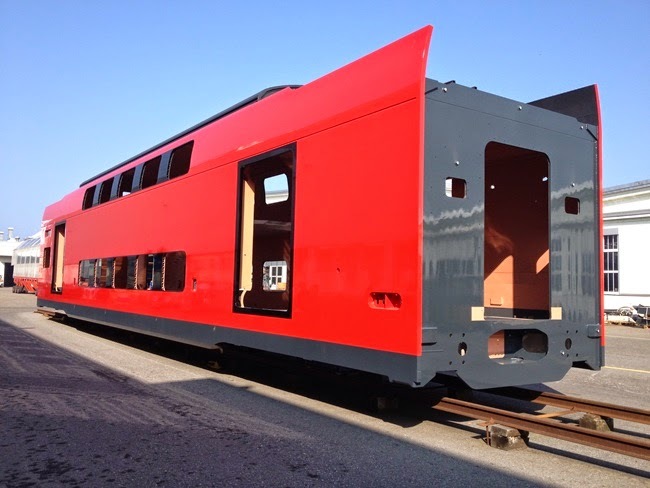 LTK has a long history of providing Caltrain's in-house vehicle expertise, and this contract expands their role. At typical overhead burden rates, the budget looks like it will pay for about 8 to 10 full-time positions for the duration of the project. It's full steam ahead, even if there remain significant obstacles. Asked if there's any danger of Caltrain not receiving the state money if the high-speed rail project is killed in the courts, Lee offered a pragmatic response. "We have to hurry up and spend the money, because if they disappear, they disappear with the money," she said. "Then we are half short." The question seems to be whether they will get any money at all, never mind spending it quickly. This could be the number one show-stopper as lawyers prepare to debate the minutiae of trip times and compliance with the bond act. If the HSR project folds, things may quickly become interesting. Piece-mealing challenge. The DEIR is likely to draw a lawsuit that challenges the boundaries between the electrification project and the high-speed rail blended project, claiming that electrification is the camel's nose under the tent for HSR. CEQA prohibits a practice known as "piece-mealing," whereby projects are analyzed incrementally by parts to make the environmental impacts appear smaller. Caltrain would have to make the case in court, as it already does in the DEIR, that the electrification project stands separately on its own merits regardless of the source of funding. CEQA is a self-enforcing statute, so lawsuits of one kind or another are expected. Regulatory teething issues. A big question mark is the CPUC rule-making process for 25 kV electrification, which despite the world-wide ubiquity of this technology is nevertheless a first within the borders of California. The CHSRA consultants have run away with the process by tailoring it far too narrowly to high-speed rail, which may create a problematic regulatory gap for Caltrain and delay the electrification project. As is customary in 21st-century California, the process will be far more expensive, slow and litigious than in other first-world countries. Par for the course. 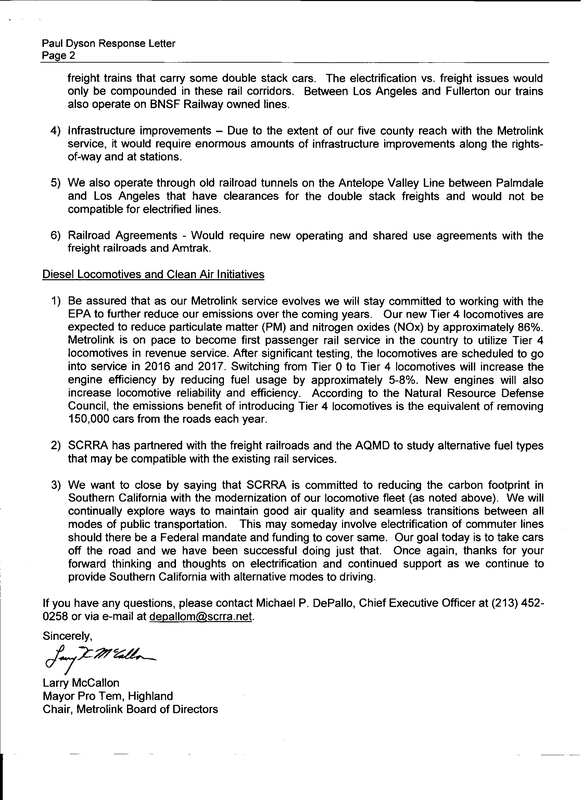 The high-speed rail draft 2014 Business Plan is out, with some interesting implications for the peninsula corridor. The ridership model has been (somewhat) updated, although much more is supposed to come, and it's clear that there is now more emphasis on serving local markets. This theoretically places the high-speed rail system in direct competition with Caltrain. An example service plan, buried in the supporting documents, is shown at right. The majority of early-morning trains are local commuter milk runs, including 4 trains per hour serving peninsula stops as well as 4 trains per hour from Palmdale to Los Angeles. That's all well and good for starting up service in the morning, but one wonders how these customers are catered to during the evening rush (especially to Palmdale) when these commuter milk runs will have to co-mingle with long-distance express trains long before the midnight shut-down, unlike in the early morning when the milk runs coincide with the 6 AM startup. Here on the peninsula, the speed differential between HSR and Caltrain will be far less, so this problem isn't as acute. The trip times embedded in the business plan and the underlying ridership calculations now appear consistent with what can be achieved in a Caltrain - HSR blended service pattern on the peninsula corridor. These trip times are significantly longer than the 30-minute theoretical SF to SJ minimum that could be achieved under ideal conditions as demanded by the HSR bond measure. While this shortfall is sure to be the subject of further litigation, it should not detract from the far more egregious loss of trip time due to poor routing choices in the southern part of the state. The trip between San Francisco Transbay and San Jose is conservatively timetabled at 47 to 49 minutes including a two-minute stop in Millbrae, which is consistent with Caltrain's analysis of blended Caltrain / HSR operations assuming a maximum speed limit of 79 mph for all trains (the same as today). This isn't too far off from today's Baby Bullet timetable, which includes three more stops than assumed for HSR and therefore takes an additional 9 minutes. The fare model used to estimate ridership and revenue within the SF Bay region is based on an extremely simplistic MTC model that sets the fare to $14.97 plus $0.1283 per mile (in 2013 dollars). This results in one-way fares of $22 from SF to SJ or $22 from Gilroy to Redwood City. Such intra-regional trips displace higher yielding long-distance trips, since each seat sold for SF-SJ is a seat that cannot be sold for SF-Los Angeles. Under any realistic scenario, the HSR operator will manage yields and set a fare structure that discourages low-yield, short-distance trips. Look no further than the Northeast Corridor for an illustrative example: for a trip from Stamford, CT to New York City (roughly similar in time and distance as SF to SJ), a seat on Amtrak's high-speed Acela Express typically costs well over $100 one way vs. $14.50 on Metro North commuter rail. Using these ridiculously low fares, the ridership and revenue model for the year 2040 predicts 2.5 million annual HSR riders within the SF to Gilroy corridor, worth $51 million / year in revenue. That's approximately one-sixth of Caltrain's ridership today, but about two-thirds of the fare revenue. The model essentially predicts that HSR will poach a large portion of Caltrain's highest-yielding passengers. Caltrain need not fear for their revenue, however, since the simplistic MTC fare model that underlies this result is not likely to be used by a real-world, for-profit HSR operator. Most of the business plan assumes only three peninsula corridor stops for HSR: San Jose, Millbrae and San Francisco Transbay. The ridership and revenue memorandum, however, includes Redwood City in a fare table. 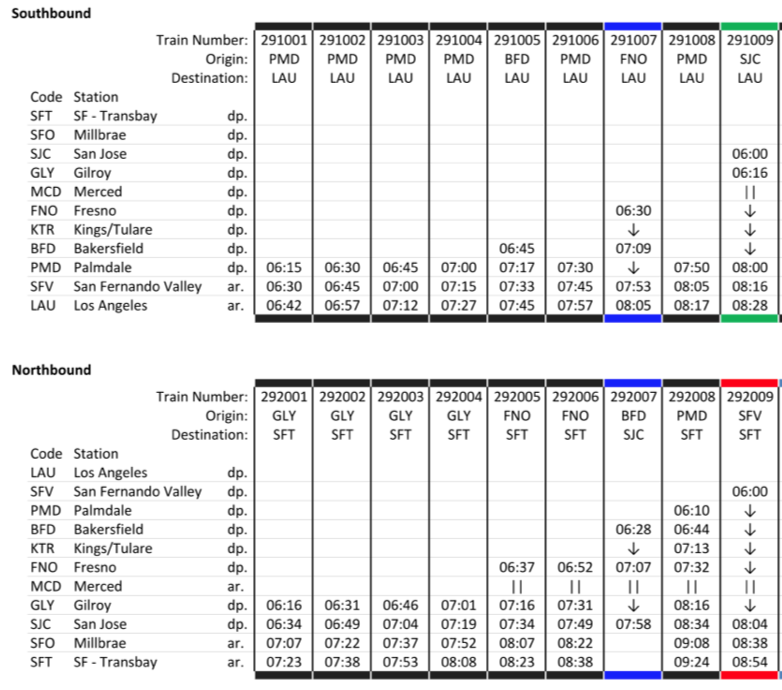 Furthermore, some of the peninsula trip times in the service planning memorandum are timetabled at 49 minutes (see example service plan, page 8, making sure to account for arrival vs. departure times), which is consistent with an additional stop at Redwood City. 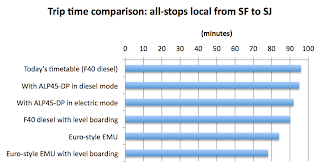 The 33-minute trip time indicated between SJ and Millbrae is very conservative and could easily be timetabled at 29 minutes (departure to arrival) with a 79 mph speed limit and including two minutes of timetable padding. The extra stop in Redwood City would bring it up to 33 minutes. Coincidence?